Some new scents for spring. In the spring, I cast aside warm, musky scents for fresh, floral fragrances. It reminds me that it’s my favorite time of year again. Nature is coming back to life and we can see flowers beginning to bloom. This year, I was sent, what I believe will be my new spring scent by Y Communications and Consulting. They gave me the opportunity to try out the Zoella Beauty Creamy Madly Dreamy Body Lotion.I’ve been a huge Zoella fan for quite sometime now so when I was asked to test out her products, I jumped at the chance. If you’re into soft and subtle scents, this may be right up your alley. The Zoella Collection just launched in January and can be found exclusively at Target, so I don’t know about you l, but I’m definitely going to stop by and pick up some others from the collection. The collection also includes hand cream, perfume, bath products and more. Another scent that you can also pick up at Target is the Soap and Glory The Righteous Body Lotion. My grandmother, mother, sisters and a handful for beauty bloggers can back me up when I say this smells so incredibly good. This has been a blogger/vlogger favorite for quite a while and it’s just recently released in Target stores. It’s enriched with Shea and Cocoa Seed Butters, as well as Sweet Almond Oil and Aloe Vera. If you have dry skin, test this out. Your skin will thank you. Trust me. 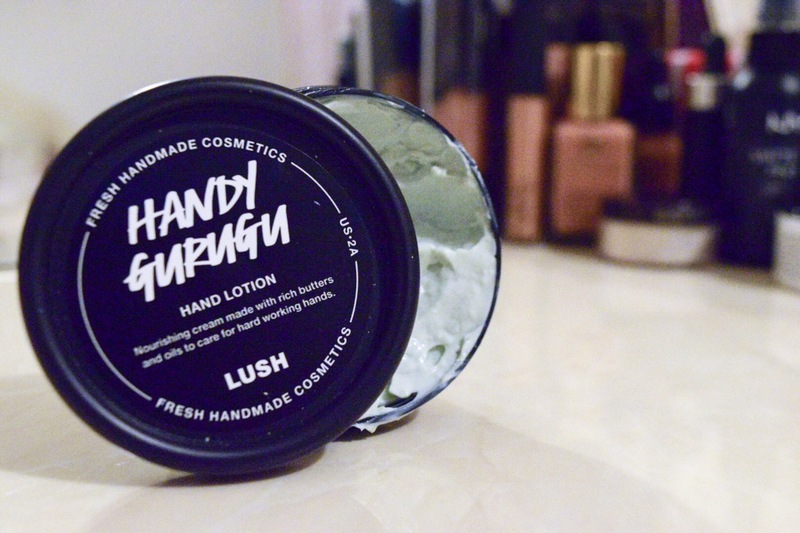 Lastly, stepping away from Target, let’s talk about Lush’s Handy Gurugu Hand Lotion. If you’re into fresher scents rather than floral, this should be on your radar. I picked this up during my birthday shopping trip and I can say honestly that this makes my hands feel so soft. It contains Shea, Almond and Cashew Butter and Rose Water. All of which, my hands absolutely love! And I think yours will too. I will warn you that this one is a little thicker than the other two so if you’re not a fan of thick creams, I would say to opt for one of the other two. Regardless, all of these are wonderful and perfect scents for the spring time. Have you tried my Of these, or should I try something else? I’d love to know what you’re using. Happy springtime and happy moisturizing!